After many months of planning, prepping, and sewing, my Renaissance Faire witch costume is done at last! For some of you who have been following along, especially on Instagram, you’ll know how long this project has taken me. That’s mainly because I wanted to incorporate the use of new skills, new garments to create, and try to be as historically genuine as I could for a witch. Now that it’s complete, I’d like to go through my goals with this project, the process, materials used, and other tidbits of that nature. With each new major sewing project I take on, I try to benefit from it by making the process a learning experience. I feel like I still have a lot to learn, and when I plan my big projects, I try to incorporate new skills I can learn and use them practically. I knew I wanted to use mostly black materials, a simple white smock, and a hat, of course. To accomplish this, I looked extensively through available patterns until I found one that I was particularly inspired by: Simplicity 3809 from their Renaissance costume series. The next pattern I had to find was one for a smock or chemise that was easy enough for me to tackle. I found one from an Etsy seller named DravonWorks, which was pretty affordable for a pattern, and it offered very detailed instructions and a pretty finished product. Once I got the patterns, it was time to plan out the overall look of this project. I traced the shape of each garment I wanted to make, jotted down some notes, and made a list of what I wanted to make and possible accessories. I knew that I needed cotton and muslin for the smock, the vest lining, and the underskirt, so that was easy enough to pick up. The outer skirt and vest were a bit of a challenge. 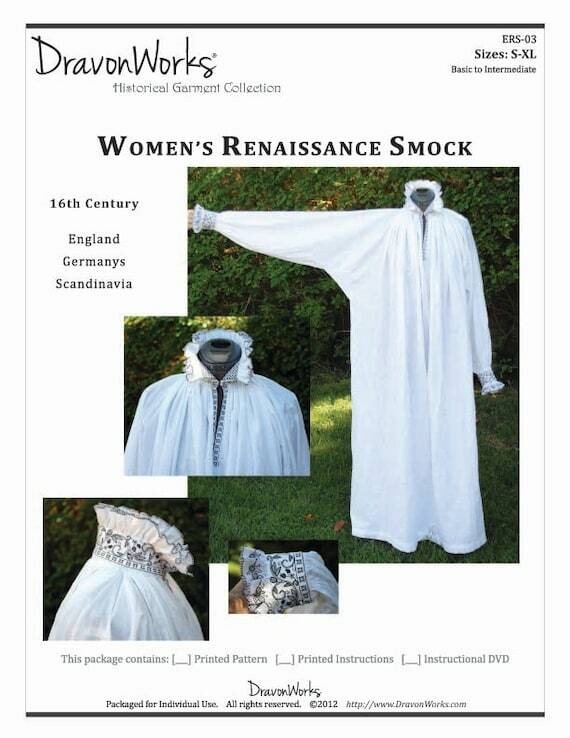 Much of Renaissance era clothing was made with wool, but knowing that I would be outside all day during a Midwestern summer (which gets pretty hot), I was worried that wool would be too much. I finally found a heavyweight linen suiting which was pretty affordable for the yardage needed. I then picked up lots of black suede cording to use as the lacing for the vest. Then, it was time to shop for the hat. I found a great tutorial on Pinterest from Delia Creates that explained how a witch’s hat could be constructed, and gave recommendations on the materials that could be used. I wound up choosing a black wool felt for the outer portion of the hat, a stiff iron-on interfacing for the large brim, and pretty purple and emerald green feathers for adornment. I decided to make a drawstring bag, since I like having a themed purse or tote to include with a costume. To make it, I grabbed some pretty iridescent fabric for the lining (and to give it that magical quality), and found a remnant of this beautiful black brocade from the home decor section of JoAnn’s. The suede cording came in handy again for the drawstring portion of my bag of tricks. I also decided to make a wand to attach to my belt for added witchy effect. I figured it’d be easy enough to find the supplies: a stick, a crystal (which I already had), and use some of the remaining suede cording for a handle and loop. I then needed to grab embroidery supplies! I wanted this project to be embroidery-heavy, and I tried sticking with somewhat neutral colors, but I was swayed by the sparkly flosses, and grabbed a gold and silver bundle. While this project was not the most challenging, it was definitely time consuming. The part that took the longest was embroidering the vest. I had wanted to do some simple designs that would be witchy, yet easy, and I wanted to incorporate practical embroidering techniques, like sewing in eyelets. But the problem with embroidering something like that is once every other piece has been made, you cannot do anything else to move forward until the embroidering is completed. Initially, when I was planning this project out, I figured that the most difficult part would be making the smock. I have never made a garment like this before, and I was afraid that I wouldn’t understand the pattern I had bought to use. Ironically enough, it was the easiest part of the costume to make–and one of the funnest piece, too. The smock also allowed me to play around with some stitches I’ve had yet to try out on my sewing machine. The overskirt was easy, but I’ve made so many similar to it that it was a pretty bland part of the process. Adding the scallops and crystals helped, though, which was inspired by a clothing-maker I discovered on Instagram called Goatspell. Perhaps my favorite part to make, though, was the hat. It required the most math (which perplexes me, since it was the best piece to make), but it was damn well worth drudging up 7th grade arithmetic to create this piece. While the process was also fairly simple, it was the most rewarding, as it only took about 2 hours in total to make. It was extra rewarding decorating it with lavish feathers, too. Overall, I love this project. I was incredibly comfortable wearing it (even though it was 90 degrees that day), and I had a blast walking around as a silly witch who danced and bobbed for much of the day–especially after a couple of glasses of honey mead. What I like about it most now, though, is that it will be a costume I can wear multiple times for the next few years, and now that I have built-up this skill set, I can add on to it. The smock pattern was one of the best I’ve used, and I wish all patterns were as detailed as this one. Actually, while we’re on the subject of patterns, the Simplicity 3809 one was perhaps the most disappointing part of the whole process. Though I mainly used it for the skirt and vest portions, the instructions on how to construct the vest were perplexing–particularly the design of the vest. I wound up doing my own thing, and referred back to a simple vest pattern I have in my stash, which worked out great. Other than that, I feel like I accomplished my main goals. I got to learn basic embroidery techniques, I was able to create a historic costume (somewhat), and I got to make a hat! It all worked out for the better, I think. What I love the most about this project is the fact that I incorporated so many new skills into an unfamiliar type of costume, and had results like this turn up! Just goes to show that as long as you keep working at something, you’ll achieve the best possible results! What do you think of my costume? Have you ever been to a Renaissance Faire? Let me know in the comments below so we can nerd out! Previous Post Nerd∙ily Q&A | Get to Know Me! Your costume is very cool! I’d like to make something similar once. Thank you! You can definitely do it if you put the work in!